FedEx workers at a sort facility at the FedEx Oakland Airport in Oakland, California, unload a shipping container in November, 2005. Photo by Justin Sullivan/Getty Images. Although FedEx and UPS are actively working to bolster the coming Republican tax bill, both companies have already received millions of dollars in state tax benefits with mixed results in terms of subsequent job creation, according to dozens of filings for tax breaks reviewed by TYT. In one case discovered by TYT, UPS won a tax credit that required job creation and declined to use it. TYT previously reported that both of these logistics industry titans, two of America’s largest employers, have invested hundreds of millions of dollars in initiatives which could undercut creation of full-time jobs—including automation, driverless vehicles and drones, a contractor-based driver model akin to Uber, and the use of part-time student labor. Both companies already have considerable assets available for use in new hiring. UPS reported $49.6 billion in gross profits for 2016, while FedEx reported $38.3 billion for fiscal year 2017. Both companies also paid out billions more to their investors in the form of dividends and stock buybacks. Neither FedEx nor UPS responded to questions emailed by TYT about whether the companies would expand their own headcount in response to a tax cut. But UPS CEO David Abney told the audience at a September 20 event held by the Business Roundtable—a consortium of corporate CEOs—that revamping the U.S. tax system is “about growing the American economy, creating jobs, and giving us all a chance to be competitive.” Publicly, FedEx CEO Fred Smith has only gone so far as to predict economic growth and wage hikes for blue-collar workers. On CNN last week, Stephen Moore—a senior economic adviser for Donald Trump’s presidential campaign—said that Smith told him during a private dinner that in the event of a corporate tax cut, FedEx would create “thousands” of jobs. Moore told TYT that the conversation took place at a dinner hosted by the Committee to Unleash Prosperity, a group cofounded by Moore and other conservative economists, as well as Forbes Media CEO Steve Forbes. Moore said that Smith’s remarks were made in the context of a 15 percent corporate tax rate, which President Donald Trump has publicly endorsed. The tax guidelines released by Republican congressional leadership call for a 20 percent corporate rate. The dinner appears to have taken place on September 18, according to a tweet posted by Larry Kudlow, a CNBC senior contributor and another cofounder of the Committee to Unleash Prosperity. Another Kudlow tweet from the same evening indicates that U.S. Rep. Diane Black (R-Tenn.) was also in attendance. Black announced in early August that she is running for governor in Tennessee, FedEx’s home state. FedEx did not reply to TYT’s request for confirmation of Moore’s account. Both FedEx and UPS have already received numerous tax benefits from state governments where they have significant operations. An examination of those tax benefits and their impact on job creation suggests unclear prospects for the ability of additional tax cuts to unleash new hiring by the two companies now. The state of Indiana prides itself on the “Hoosier Hospitality” of its people. But it’s also an apt description for the state government’s treatment of large corporations, including UPS. UPS has applied for and been approved for at least $9.025 million in tax benefits from the Indiana Economic Development Corporation (IEDC) since 2012, according to contracts reviewed by TYT. However, more than $8.3 million of those benefits has yet to be disbursed, in part because some Indiana state tax-assistance programs are contingent on provable job creation. The tax dollars already distributed to UPS by IEDC went not toward job creation, but toward improving “efficiencies” within the company. TYT has learned that the one time in recent years in which IEDC granted UPS a tax credit contingent on job creation, the company backed away from the deal. The tax credit was worth $875,000. It was approved in 2013 by the IEDC to go toward a UPS logistics coordination hub in Jeffersonville estimated to cost the company about $4 million. In exchange, the company promised to create 207 jobs at a minimum wage of $11.05 per hour. But UPS never built the hub in Jeffersonville. Holly Gillham, a media relations specialist for IEDC, told TYT that even though UPS was offered the tax credit on the condition it created the jobs, the company did not go through with the deal. Gillham referred TYT to UPS for all other questions regarding the company’s operations and plans in Jeffersonville. Victor Smith—who signed off on the deal as Indiana Secretary of Commerce and CEO of the IEDC at the time, under then-Governor Mike Pence, and now works at the lobbying and law firm Bose McKinney & Evans—did not respond to a request for comment. TYT was informed that he was out of the office until Friday. IEDC also granted a $150,000 tax credit to UPS in 2015 for a two-year period at its Supply Chain Solutions site in Indianapolis. It was, according to the application filed by UPS, contingent on maintaining the site’s 872 existing jobs, but not on creating any news ones. Instead, the money went toward obtaining “new equipment and training its employees to improve efficiencies” for the company. Also that year, the company landed a $200,000 tax grant from the state for the primary purpose of “enhanc[ing] the training and workforce skills of their employees,” again in Indianapolis. This agreement also did not involve job creation but was instead contingent on maintaining its “base employment number” for the lifetime of the agreement and training 750 workers. In Plainfield, Indiana, a new set of tax incentives will be given to UPS only if it creates the full-time equivalent of 578 jobs over five years. UPS has requested $200,000 in subsidies for training and a total of $7.5 million in conditional tax credits from IEDC for the 893,000-square-foot facility it plans to construct in Plainfield by 2019. In the state housing its biggest logistics hub, Kentucky, UPS has also received large subsidies and tax credits. In 2015, UPS got $1.75 million in tax rebate money from the Kentucky Economic Development Finance Authority for its highly automated Centennial Hub in Louisville. According to the Kentucky Cabinet for Economic Development, the tax deal aims to create 12 new jobs. UPS also was given $15 million in tax credits in 2006 by Kentucky, which was used for the creation of what would become the “largest automated package handling facility in the world” at its Worldport facility in Louisville. Though the local business press reported that the tax assistance was based partially on UPS’s projected creation of 1,284 full-time jobs and 3,787 part-time jobs, the type of tax deal given to UPS is not contingent on provable job creation. The agreement was, however, contingent on maintaining the location’s existing jobs, a common requirement for state tax-benefit deals. 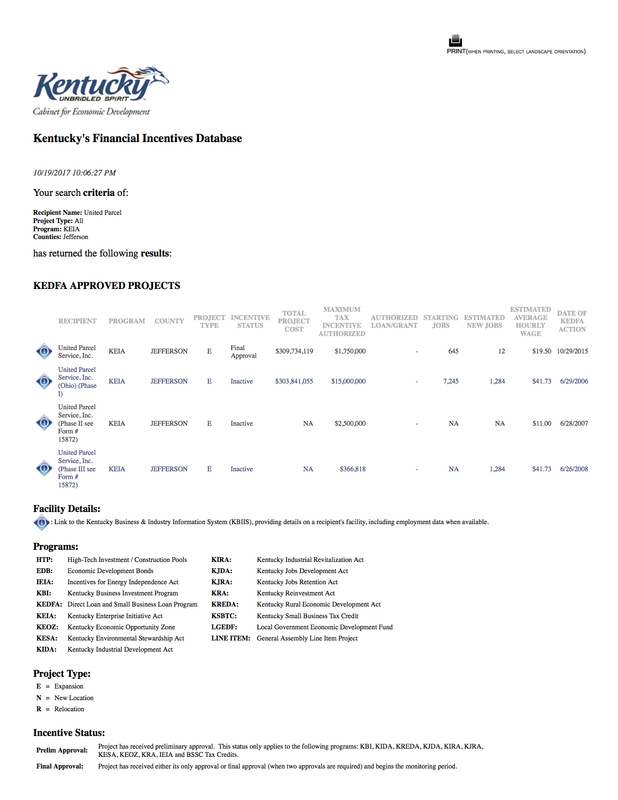 As the Kentucky Economic Development Finance Authority details, the type of tax incentive given to UPS for Worldport can entail “expenditures for building and construction materials, research and development equipment, and acquisition of real property that is owned, used or occupied by the approved company.” Labor investments are excluded from this type of tax perk. UPS got another $2.5 million in the same type of tax benefit for the facility in 2007. FedEx has also benefited from tax benefits, including a multimillion dollar one in its home state of Tennessee. In 2012, the company landed a $14.64 million Tennessee tax abatement, which went toward expanding a FedEx pilot training facility at the Memphis Airport. It created zero jobs in the process. Another 2014 Tennessee tax abatement helped FedEx create 87 new jobs in the state, according to numbers crunched by the Economic Development Growth Engine for Memphis and Shelby County and the University of Memphis’ Sparks Bureau of Business and Economic Research. The $679,040 state subsidy went toward expanding a company subsidiary, FedEx Supply Chain Systems, in Memphis. 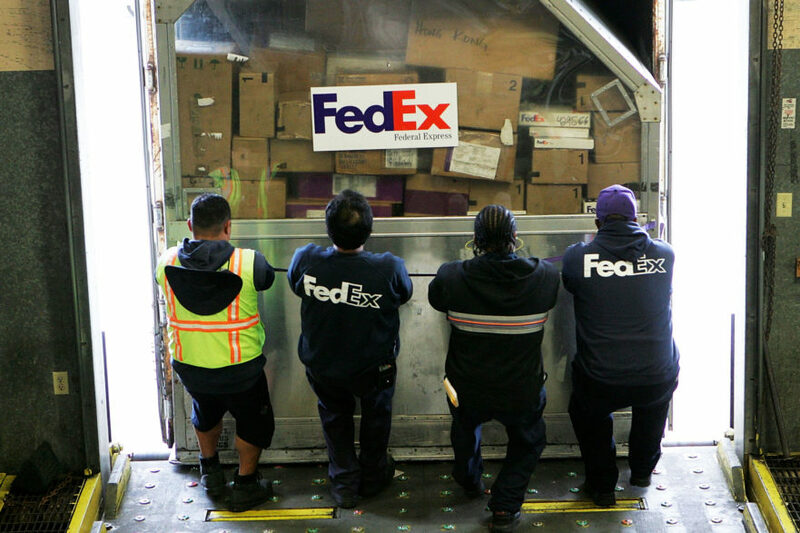 FedEx Supply Chain Systems, formerly known as GENCO until FedEx acquired it, had threatened to leave Memphis and move to Olive Branch, Mississippi, if Memphis and Shelby County in Tennessee did not give it a tax break. FedEx won tax subsidies in Illinois, too. The Illinois Department of Transportation’s Economic Development Program gave FedEx a $2 million subsidy toward its Cherry Valley hub in 2008. According to forms it submitted with the Illinois Department of Transportation (IDOT), FedEx has created 31 jobs there since receiving the money. None of the states in question require companies receiving their tax benefits to report whether the jobs created are new jobs or relocated ones from other states. Find the full “TYT Investigates Series: Tax Cuts & Job Creation – UPS & FedEx” here. Follow TYT Investigates on Twitter and Facebook.